Without the petite Agnesia’s okay on a helicopter’s mechanical airworthiness, it will not take to the Mpumalanga sky. As a tool in the day-to-day operations of the Kruger National Park, the helicopter performs a vital role, and keeping the more than 1 277kg machine airworthy falls to helicopter technicians like Agnesia Makgotla. She cuts a petite figure against the hulking machine and when Saturday Citizen spotted her, Agnesia was wrestling with the main rotor gear of the helicopter. The three more than 10-metre blades have already been removed and despite the ructions caused by the gaggle of journalists in the hangar, Agnesia’s brow remains furrowed as she focuses her attention on her task at hand. An aviation industry joke says helicopters don’t actually fly as much as they beat the air into submission. It’s only through incredibly complicated design and the interaction of hundreds of moving parts that Newton’s laws of motion and the Bernoulli Principle can be used to result in an inherently unstable vehicle taking to the skies. And without Angesia’s okay on a helicopter’s mechanical airworthiness, it never will. “My dad was a self-taught mechanic, so he was always fixing cars and telling me I would never be able to take anything apart and then put it back together,” says Agnesia with a laugh. “Unfortunately, he’s passed away, but it would be nice to show him what I’m doing now,” she says, wiping a smear of grease from her face. 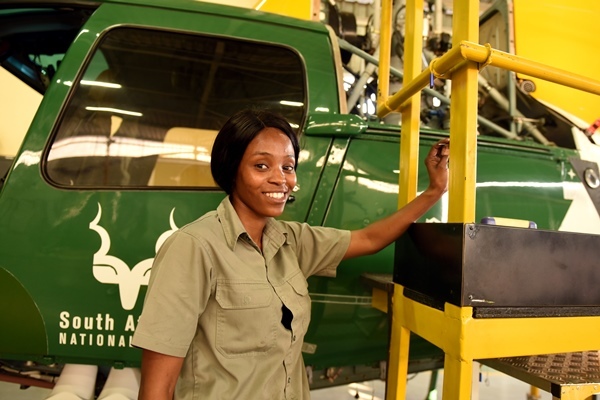 Agnesia says she had never aimed to land up in the Kruger, but an interest in aviation led her to Denel where she completed her apprenticeship as a helicopter technician after nearly two years. Afterwards, and having successfully completed her trade test, it was time to find a job. Once Agnesia completed her certification on the South African National Parks’ Airbus “squirrel” helicopters, the rest was history. According to the South African Civil Aviation Authority (SACAA) 2016/17 annual report, the total number of South African licensed personnel was 33 452. When cabin crew members are excluded, the number came to 17 622. Of these, the combined total of African, coloured, and Indian men and women was 1 461, while that of women of all races was 1 530. 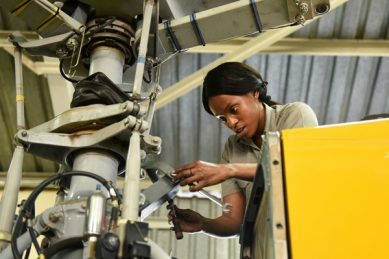 The SACAA has called for more women to enter the industry at every level and during its last financial year supported the training of nearly 30 of them. 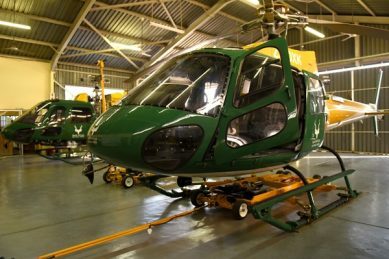 Denel Aviation trains up to 300 people a year, says spokesperson Zizi Mlokoti, in diverse fields such as aircraft mechanics, electricians, instruments and avionics. Denel also offers apprenticeships in engineering such as fitter and turner, millwrights, welders, and turner and machinist. Agnesia said it was possible to do an apprenticeship with a matric or an N7, but the degree helped. Soon, it’s plain to see Agnesia wants to return to work on her chopper in the cavernous hangar which is far from the bright city lights and baking under the Mpumalanga sun. “The lure of the city never attracted me. I’ve settled very well, I actually love it here. It’s like home,” Agnesia says. Her final words are perhaps a lesson for us all and give weight to the cliché, if you love what you do, you’ll never work a day in your life.